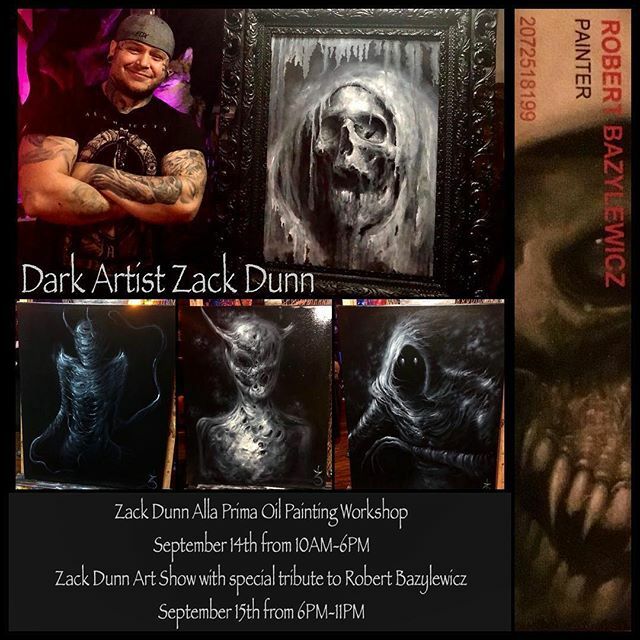 Join us at @venominktattoo for an amazing display of @zackdunn89 ‘s Oil Paintings with Zack Dunn himself, September 15th from 6PM-11PM at 751 Main Street Suite A Sanford ME 04073. Don’t miss the opportunity to meet one of the greatest dark artists of our time. Many original paintings as well as prints will be available at this show for purchase. Special showing of our close friend Rob @floodthisearth ‘s original work as well as prints for purchase will be available at the show as well, all proceeds will go towards creating a published book of Robs sketches during his inspiring life as an artist. Sadly we lost Rob Unexpectedly before he was scheduled to join Zack last year for an art show at our studio, he will be here with us in spirit this year to celebrate his life as an incredible person and artist who’s work deserves to live on in this world despite his absence. Also September 14th the day before the show, Zack will be instructing a black and grey alla prima painting seminar where you can learn his technique on how to do an 11×14 oil painting start to finish in just one sitting. Examples of Zacks alla prima paintings are seen in the picture above. $150 per person all supplies included with limited slots available. Please direct message me to reserve your spot for this once in a lifetime opportunity to learn from a master of the craft. Thank you everyone for the continued support over the years and we look forward to seeing you in September!